"The Avengers" - Who remebers these? 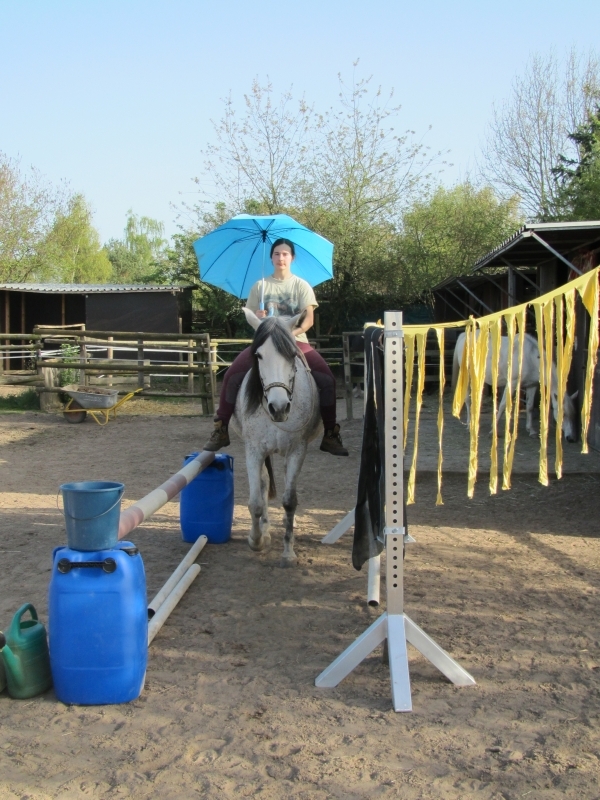 But umbrellas and comparable things often are a huge challenge for horses! Such a thing makes spooky noises when popping up and retracting, one gets it hold above ones head and a horse cannot spot an object in the position behind-above very well due to its visual system - Therefor it could be dangerous! 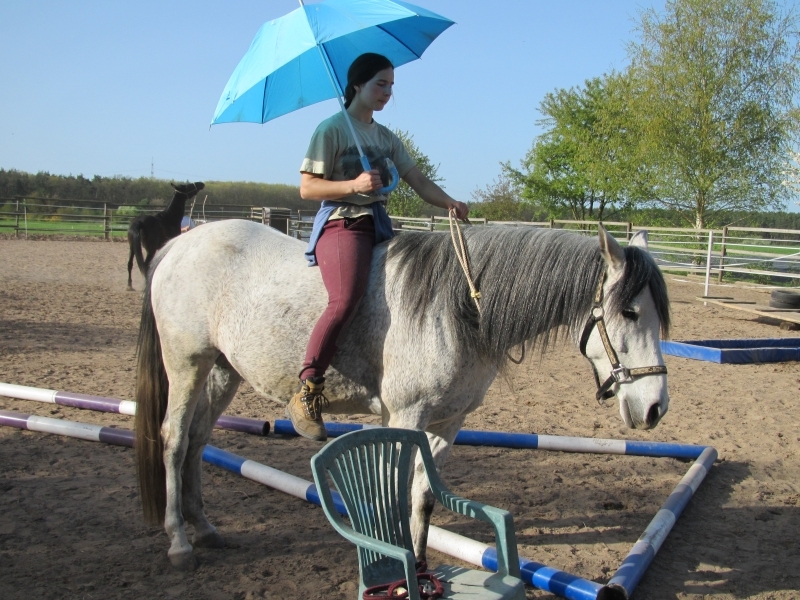 A friend of mine once owned a horse which was lying in its box sleeping, when due to heavy rainfall someone came hastily running into the stables, ripped open the door and in an instant strongly and noisily shaked out his wet umbrella. 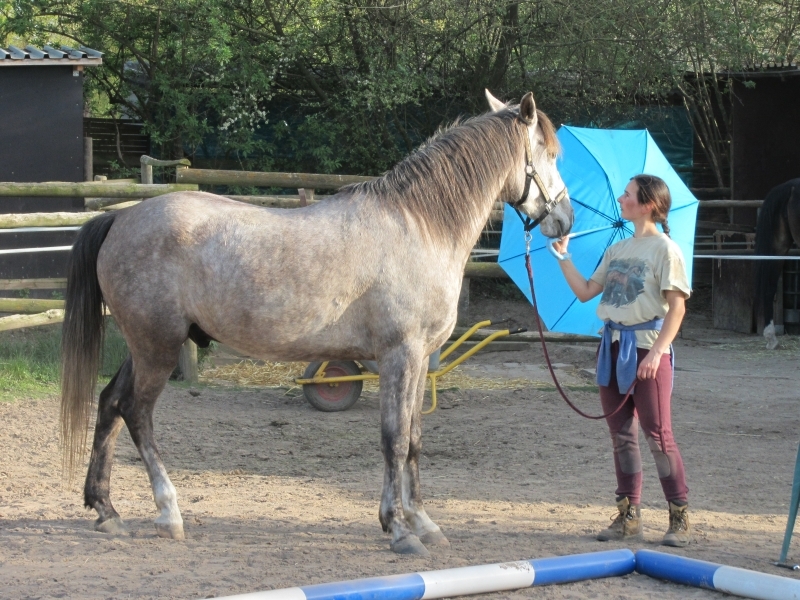 The horse, abruptly scared out of his sleep, thus did get afrightened suchlike severely and sustainably that afterwards it could never again be confronted with an open umbrella! 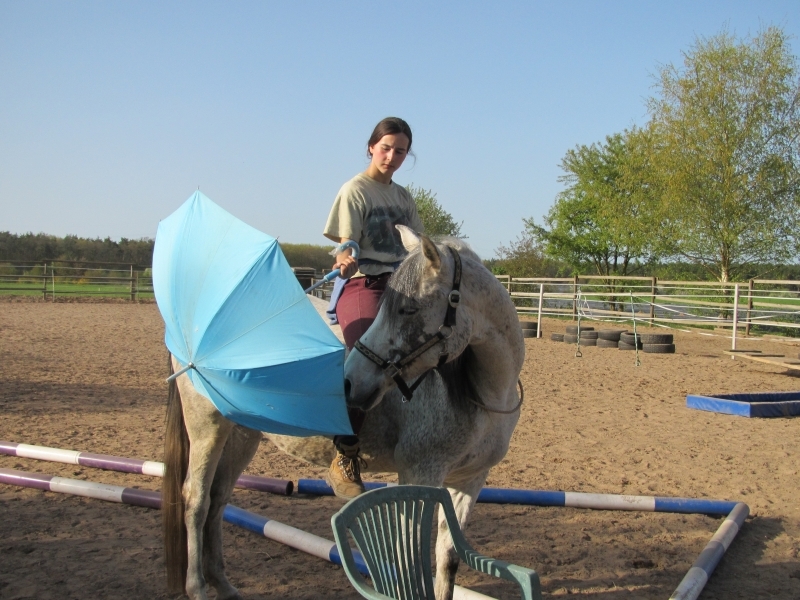 Fortunately out horses never suffered an "umbrella shock" as the following pictures prove. 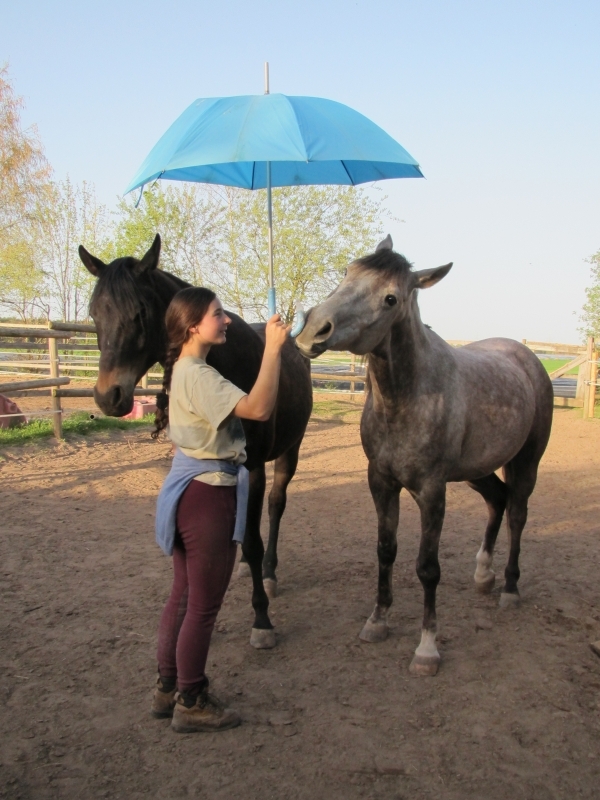 Rather also an umbrella is being inspected curiously and with interest and it doesn't need any harness or other material to have the horses stand still quietly and even-tempered. 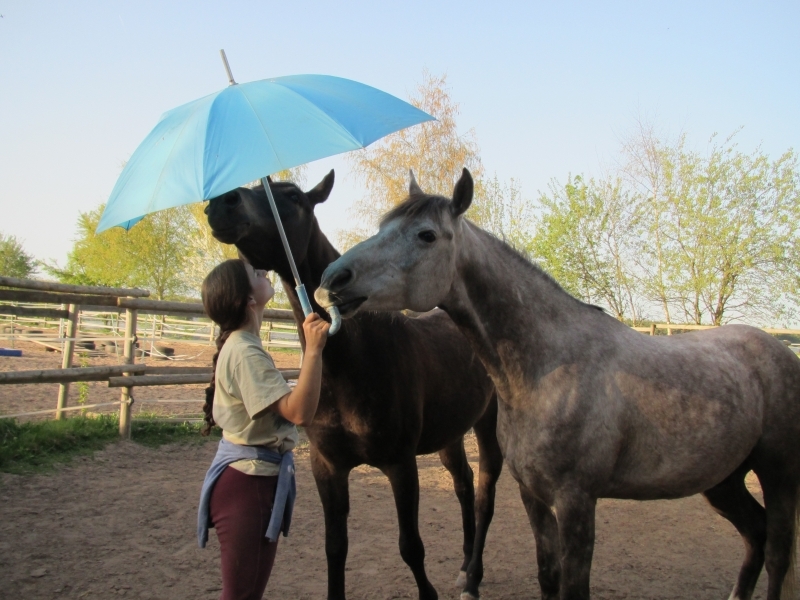 Our horses thereby stay so calmly, that it could be dared without problems to sit on them carrying an umbrella without a saddle! ...not even in combination with other challenges! 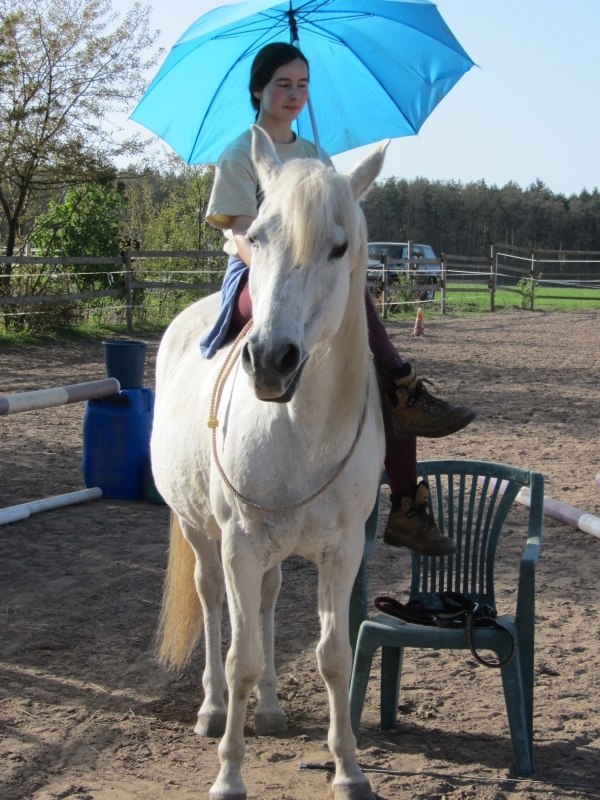 Such an umbrella can of course be opened when sitting on the horse! 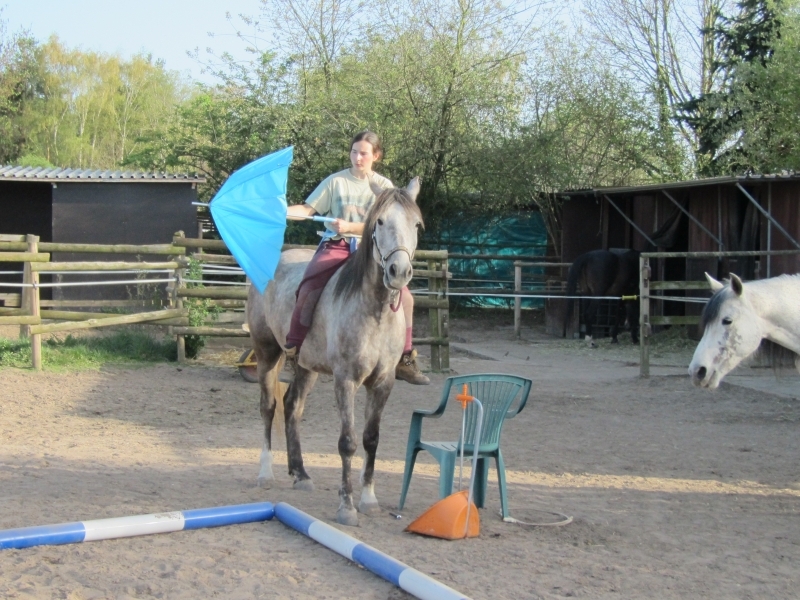 The horse is attentive but calm and in no way anxious! And we absolutely want to have "attentive", after all it is no fun cowering on a slow coach! Here again: In no way anxious but attentive, calm and interested! Observe the relaxed position of the ears, the coolly lowered head and the rested hind hoof. No hidden tenseness is visible here but this calmness is for real. 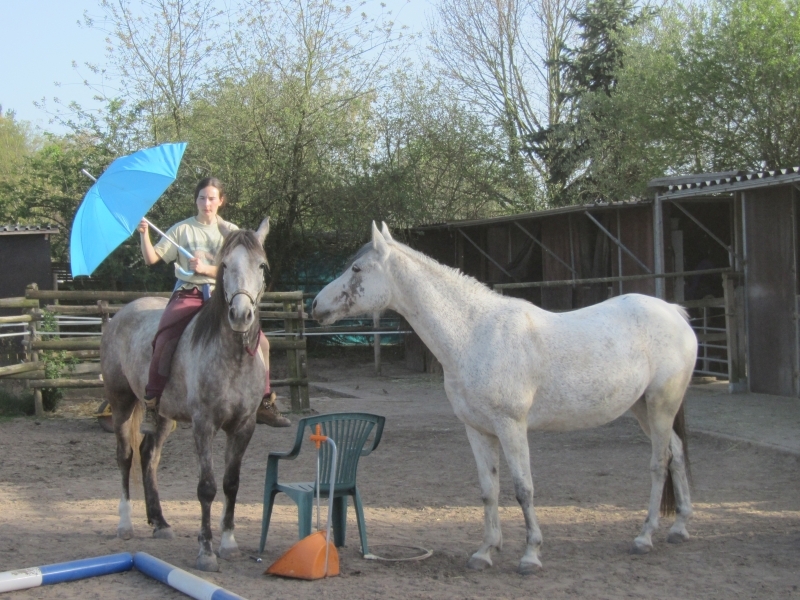 If you start practicing the umbrella with your horse you should (as usual) play it safe. An umbrella has a large tip on the top and many small ones on its ends. A horse who doesn't know the things being hold above its head and gets frightened of it, easily jerkes up its head abruptly. If you don't pay attention one of the tips could easily get in dangerous proximity to the eyes, that could go badly amiss! 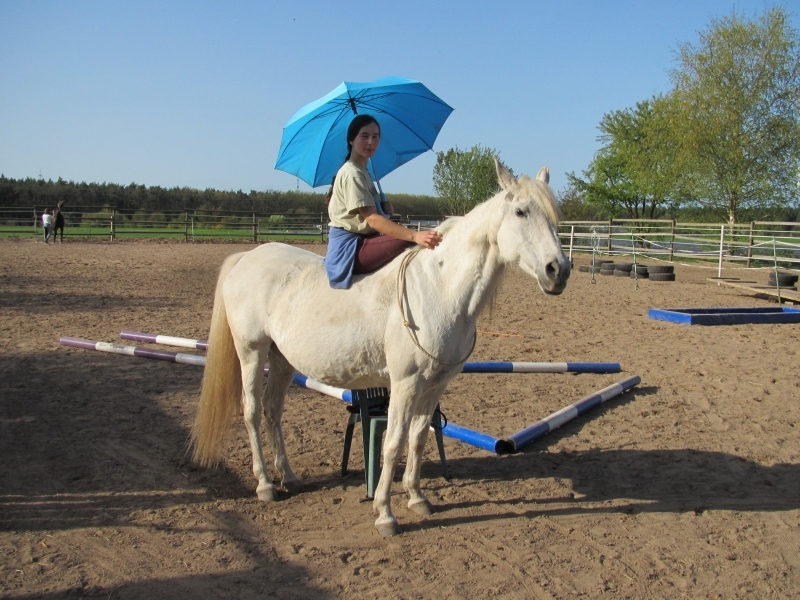 Here it holds good again to acquaint the horse slowly and carefully with the umbrella.